One of the things I”m most interested within education and libraries is how we can use the library as a tool for satisfying students’ curiosity. The library is a place to find stuff out and I’m here to show students how to do that. I’m not a very smart or very gifted person, but I’ve always been very curious, and it’s something I think that’s probably more important to me than anything when it comes to qualities we’d love to pass on to our students as librarians and educators. How can we teach students to be curious – or want to learn more about things – is, therefore, a central information literacy question as I see it. One way I’ve previously tried to address this question in my information literacy research and teaching is to investigate what motivates people to want to do things, the idea being that if we can figure out what motivates people more generally, we can extend that to the classroom and information literacy context. It is for this reason that I’ve been extremely interested in the psychology of motivation as an information literacy educator, and have written a good deal about autonomy supportive pedagogy – particularly in the form of understanding students as people who have authentic interests and goals -and why I have attempted to incorporate that into my information literacy instruction. One way to make school a meaningful experience for students is to teach them the idea of research as an extension of their true selves, and let them build out from there. 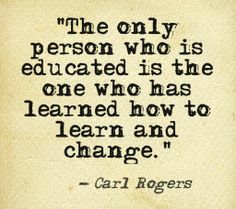 Much of my thinking about this stuff has come from personal experience and my deep love and identification with the work of humanistic psychotherapist and student-centered educator, Carl Rogers. Rogers’s “person-centered” method of counseling, which he defended at length in many essays collected in his wonderful work On Becoming a Person, was based on the simple idea that “[t]he best way I can state this aim of life, as I see it coming to light in my relationship with my clients, is to use the words of Soren Kierkegaard – “to be the self which one truly is.” Rogers follows the existential philosophical tradition in stating that the goal of life is to be one’s true, authentic self. He extended that tradition by claiming, in effect, that the reason people are unhappy is that they are living in accordance with others’ expectations and values, and claiming that a therapeutic counselor who accepts clients for who they are can help these struggling individuals have the courage to be themselves. In a safe relationship [where an individual is accepted for who she is] the individual becomes more open to his experience. This is a phrase which has come to have a great deal of meaning to me. The individual becomes more openly aware of his own feelings and attitudes as they exist at the organic level … He also becomes more aware of reality as it exists outside of himself, instead of perceiving it in preconceived categories. He sees that not all trees are green, not all men are stern fathers, not all women are rejecting, not all failure experiences prove that he is no good, and the like. He is able to take in the evidence of a new situation, as it is, rather than distorting it to fit a pattern which he already holds (115). The attitude Rogers describes here reminds me of the famous Zen teacher Shunryu Suzuki’s phrase “beginner’s mind,” where an individual lives with an open awareness, deeply committed to life as it is in the present moment. They are curious about reality as it unfolds. One of the requirements for this to be possible, for Rogers, is that we must raise our children without imposing conditions of worth on them – without rigid expectations for how they ought to be in order for us to value them – which helps them learn just how to be. As psychologist Peter D. Kramer put the point, for Rogers, accepting other people for who they are (rather than who we’d like them to be) is “the ultimate liberating force.” Indeed, Kramer writes, “Rogers … marshaled a substantial intellectual effort in the service of a simple belief: Humans require acceptance, and given acceptance, they move toward “self-actualization” (On Becoming a Person, xi-xii). Human beings, when accepted this way – by a parent, a counselor, or (as Rogers would later write), a teacher, become more open, follow their own paths in life, and “become who they are.” In Rogers’s terminology, they have a “locus of evaluation” – the ultimate meaning of their actions, whether they have value or not, comes from within. They can be who they are and explore what matters to them. Perhaps the most fundamental condition of creativity is that the source or locus of evaluative judgment is internal. The value of the product is, for the creative person, established not by the praise or criticism of others, but by himself. Have I created something satisfying to me? Does it express a part of me – my feeling or my thought, my pain or my ecstasy? These are the only questions which really matter to the creative person, or to any person when he is being creative (On Becoming a Person, p. 354). Watching my clients, I have come to a much better understanding of creative people. El Greco, for example, must have realized as he looked at some of his early work, that “good artists do not paint like that.” But somehow he trusted his own experiencing of life, the process of himself, sufficiently that he could go on expressing his own unique perceptions. It was as though he could say, “Good artists do not paint like this, but I paint like this.” Or to move to another field, Ernest Hemingway was surely aware that “good writers do not write like this.” But fortunately he moved toward being Hemingway, being himself, rather than toward someone else’s conception of a good writer … Time and again in my clients, I have seen simple people become significant and creative in their own spheres, as they developed more trust of … themselves, and have dared to feel their own feelings, live by values which they discover within, and express themselves in their unique ways (“To Be That Self Which One Truly Is,” On Becoming a Person, p. 175.). For Rogers, then, the preconditions for creativity are an openness to experience and the accompanying willingness to trust one’s own true feelings in the world, and a real acceptance from another person is required for such characteristics to develop. Now the question, of course, is what does this mean for information literacy educators? What’s all this stuff about what it means to be a person got to do with teaching students to be curious about information? What this all naturally suggests is that IL educators interested in increasing students’ curiosity (in students valuing information) have a serious interest in helping students become more open, in creating the conditions for them to be themselves in the classroom. On the Rogerian model, one thing this might mean is that IL educators should, in effect, be showing students how to use the library to research the stuff that matters to them as individuals, and being creative in showing students how they can tie that to classroom assignments. First, the educator must be real with students in the classroom. I trust I am making it clear that to be real is not always easy, nor is it achieved all at once, but it is basic to the person who wants to become that revolutionary individual, a facilitator of learning (pp. 122-123). Second, the educator must be empathetic. This attitude of standing in the other’s shoes, of viewing the world through the student’s eyes, is almost unheard of in the classroom. One could listen to thousands of ordinary classroom interactions without coming across one instance of clearly communicated, sensitively accurate, empathic understanding. But it has a tremendously releasing effect when […] students feel … they are simply understood, not evaluated, not judged, simply understood from their own point of view, not the teacher’s. If any teacher set herself the task of endeavoring to make one non-evaluative, accepting, empathic response per day to a student’s demonstrated or verbalized feeling, I believe she should discover the potency of this currently almost nonexistent kind of understanding (pp. 126-127). The facilitator who has a considerable degree of this attitude can be fully acceptant of the fear and hesitation of the student as she approaches a new problem as well as acceptant of the pupil’s satisfaction in achievement. Such a teacher can accept the student’s occasional apathy, her erratic desires to explore byroads of knowledge, as well as her disciplined efforts to achieve major goals. She can accept personal feelings that both disturb and promote learning – rivalry with a sibling, hatred of authority, concern about personal inadequacy. What we are describing is a prizing of the learner as an imperfect human being with many feelings, as many potentialities. The facilitator’s prizing or acceptance of the learner is an operational expression of her essential confidence and trust in the capacity of the human organism (p. 124). These are the exact attitudes of a Rogerian counselor, and it is these same qualities that I’ve tried to openly manifest in the classroom and during reference interactions with students. The interesting implication here is that not only is the IL educator interested in promoting student curiosity necessarily interested in what makes human beings tick – they’ve got to be a certain kind of person as well: one that students view as real, empathetic, and supportive of their personal autonomy. Thus, it’s no small task for the information literacy educator to engage with students in an authentic way to stimulate their curiosity. It’s just an essential one.